65 plate S/C using an O2 SIM, gives me a really rubbish 3G hotspot, is this all the systems capable if or is it my SIM data? We have to remember that LR up until recently were really well behind the curve with their in car electronics/infotainments systems. Pushing cars out with 3G cell capability when 4G has been around for years was criminal. Not quite that much Red, but I've always had green LR's, so I skimped on some other features to get the colour I wanted. The 's have put it up 20%!!! It's mind boggling how these big companies get away with it!! Just mustn’t go back into the stealership for two years ! He who dies with the most toys, Wins !!!!! Agree with the above about the RR failing to deliver for the ever greater and rapid increases in price. Don’t forget the £20k jump in price LR added between the L322 and the L405. I’m beginning to think the LR range as a whole is becoming agricultural compared to the competition. Most 4x4 will do 90% of what the owners want, most rarely go off road. LR produce vehicles with comparatively laggy drive trains, uneconomical engines, poor reliability and 10 year old technology. I had a 2010 S-Class with 100% better tech than my RR. My wife’s Volvo XC40 has modern technology, a brilliant drivetrain and just does the job. Dealer service is excellent and cheap. She loves it compared to the Evoque and DS Sport she had before this. She’s not going back to LR. I had a look at the Q8 mentioned by Chalky. I didn’t know it existed. Configured one at £65k with everything I wanted. That’s without any discount. The technology will be outstanding compared to the RR. It will do everything I want it to and has better fuel economy. 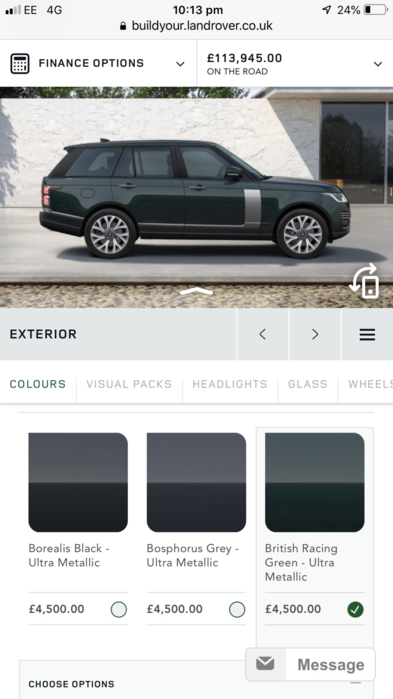 Only the RR’s image will be missing but I’m thinking that’s worth it when it will cost me double the cost of the Q8 to replace my RR.